Would you like to get a glimpse into the philosophy of the Liturgical Movement in the 1930s? This period between World War I and Vatican II witnessed some important ideas which were to have a great influence on the renovation and building of Catholic churches. Of central concern was the design of the altar, which is the main topic of this short book first published in 1936. The Liturgical Movement’s goal was to promote simplicity in the design of liturgical elements without being iconoclastic. Geoffrey Webb was an architectural historian and Cambridge professor. 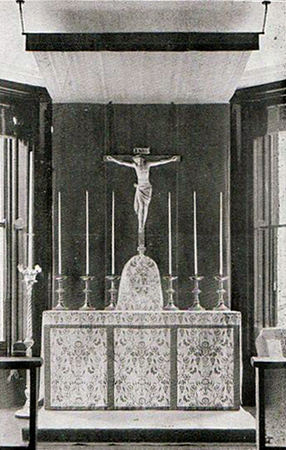 His essay on the altar contains wonderful historical and liturgical information on the altar and its appointments: tabernacle, candles, altar crucifix, veils, and linens, as well as elements seldom discussed today such as Eucharistic thrones, testers, antependia, and riddel posts. Most books are a product of their time, and reading The Liturgical Altar today, one can understand how the liturgical movement may have unwittingly laid the foundation for the embrace of modernism. Using liturgical law, the rubrics of the Mass, and historical precedent the author argues for a simple and primitive altar. Yet what Webb advocates seems downright traditional when compared with the wooden tables of the past thirty years. He argues for a stone altar with a completely veiled tabernacle and candlesticks, a crucifix behind, a baldacchino, an altar frontal, and riddel screens placed on three sides. Medieval England was seen as the golden age. On the reredos Webb writes, “however skilful the technical achievements of such erections, they take to themselves the importance which belongs of right to the altar.” Thus, the reredos, or altarpiece, competes with rather than completes the altar. Put in this way it is possible to recognize how the Liturgical Movement of the 1930s, with good intentions, segued into the minimalist altar and the iconoclastic church of the late twentieth century—all in the name of proper liturgy. 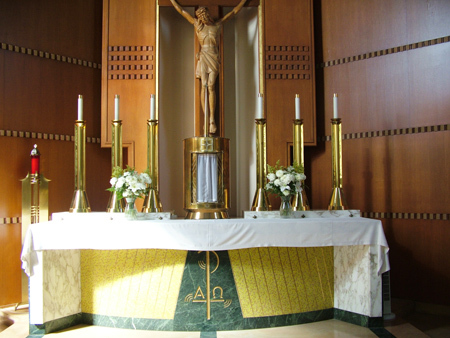 By the time of Vatican II, it could be argued that the tabernacle, crucifix, and candles were not integral to the architecture of the altar, and should be moved elsewhere. Baldacchinos and testers were seen as an unnecessary distraction which, along with steps and predella, take away from the liturgical simplicity of the altar. By the 1960s, getting back to the simplicity and austerity of the liturgical altar meant to strip it of any added accoutrements. Brought to its logical conclusion, what we are left with is a bare table, the tabernacle is hidden away, and the sanctuary loses all distinctiveness.